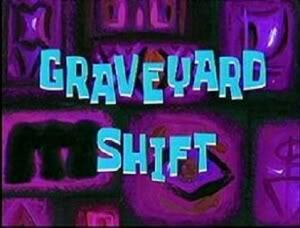 Graveyard Shift (Episode) – From SpongePedia, the biggest SpongeBob-wiki in the world! 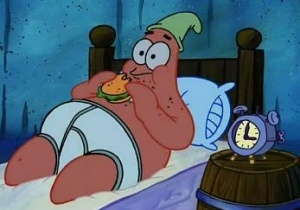 Patrick eating a burger at 3 o'clock AM. It is closing time at the Krusty Krab and Squidward is getting ready to go home. Tom, however, appears and attempts to order a krabby patty and french fries. When Mr. Krabs realizes he'll generate more cash if he kept the Krusty Krab open 24/7, he tears apart the closed sign and declares that the restaurant is open 24/7. The customers rush in, and Mr. Krabs leaves. SpongeBob then appears and gets excited about how great it is to work at the restaurant 24/7 and sings a song about it, doing his "chores" as he sings. Squidward then tells him to take out the trash, and SpongeBob does, but becomes terrified (even though he tries to hide it). When he walks in and ignores it, Squidward tells him about the story of the Hash-Slinging Slasher (the ghost of a former fry cook who died near the restaurant that tries to attack the employees every night, showing he's coming by flickering the lights, ringing the phone, and appearing in the ghost of a bus). SpongeBob becomes terrified of the story, and screams repeatedly, while Squidward laughs. Squidward soon becomes annoyed because of SpongeBob's screaming and tells him to stop screaming, claiming that he made the story up. SpongeBob replies by laughing hysterically. Later that night, Squidward hears SpongeBob cleaning the ceiling and ignores it (until SpongeBob spooks him by shouting in his ear). The lights, however, start to flicker, but they assume it's the faulty wiring in the building. The phone then rings, but when Squidward answers, the caller hangs up. As soon as the phone hangs up, Squidward begins to count out the activity, mentioning that the walls ooze green slime. When he realizes they always ooze the slime, a bus appears, even though the buses don't run that late, and a figure similar to the Hash-Slinging Slasher appears. As soon as they see him, the become terrified, but SpongeBob assumes it's Squidward attemting to entertain him by imitating the night of the fry cook's death. Squidward, however, denies it and it approaches them. He and SpongeBob go insane and try to stay together. When the figure approaches the register, however, they discover the figure was really a teenager who wished to be a fry cook. He then explains that he called but hung up because he became nervous. Nosefuratu then appears and starts flickering the lights. When Squidward and SpongeBob notice the flickering lights and the phone, neon signs reading "Open Forever!" can be seen, but when the Hash-Slinging Slasher appears, the signs are gone. When SpongeBob screams in terror, his hat falls off. But when he hugs Squidward, he is wearing his hat on his head again. The Hash-slinging slasher was dropped off right by the Krusty Krab doors. Next shot of him, he is at the other side of the street. When SpongeBob is washing the ceiling during nighttime upside down, his hat stays on and the water doesn't spill out of the bucket. How come Mr. Krabs doesn't have to work while SpongeBob and Squidward do?